The 2019 Northern Hemisphere harvest will be here before we know it and wineries across the USA are looking for the most talented and dedicated trainees and interns to join their winery families! If you have questions about consulate applications and our program, we have compiled a list of five top questions! 1. 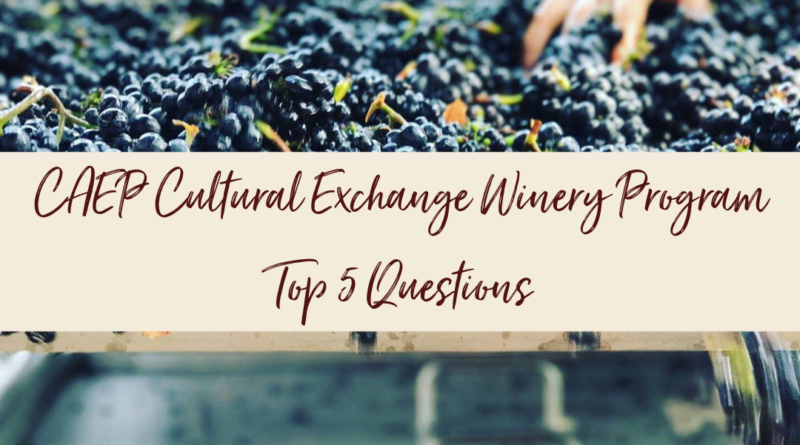 What is the length of the cultural exchange trainee/intern visa and can I take some extra time to travel and explore the culture after harvest? A cultural exchange trainee/intern visa allows you to enter the United States for a minimum of three months and stay a maximum of 12. Winery training positions typically range from three to four months. Following completion of the program, the J-1 visa allows you to travel the United States for 30 days before returning home. 2. Where is the location of the winery I could be placed at? CAEP works with hundreds of wineries across the United States and we do our best to accommodate your preferred placement. CAEP also will assist with consulate applications for the participants who have already been pre-placed at a winery. 3. How much time does it take to process my visa? Getting an appointment at an American Embassy depends on the country. Some countries can take appointments immediately and others are booking several weeks out. All in all, we recommend you beginning the application process early. 4. Tell me about housing? Where will I live while I am in the United States? CAEP does it’s best to assist you with finding housing. We have compiled a list of tremendous resources to assist with the search and can help answer any questions you may have about the area you may be staying in. 5. What is the cost of the CAEP program? The program fees include government fees, assistance with consulate applications, health insurance, tax preparation, and 24/7 support during your stay in the United States. Don’t forget, our early bird special to save up to $450 ends April 30! 6. Am I required to have health insurance during my time in the United States? Yes. All cultural exchange trainee and interns are required to carry health insurance from the day they leave their home country until the day they return home. CAEP offers a low-cost, comprehensive policy option to trainees and interns which is included in their program fees. 7. Taxes are confusing. What do I need to have done to complete my taxes? All cultural exchange trainee and interns are required to pay state and federal taxes. CAEP program fees include tax preparation. Phew! Visit our website caep.org to begin the application process! 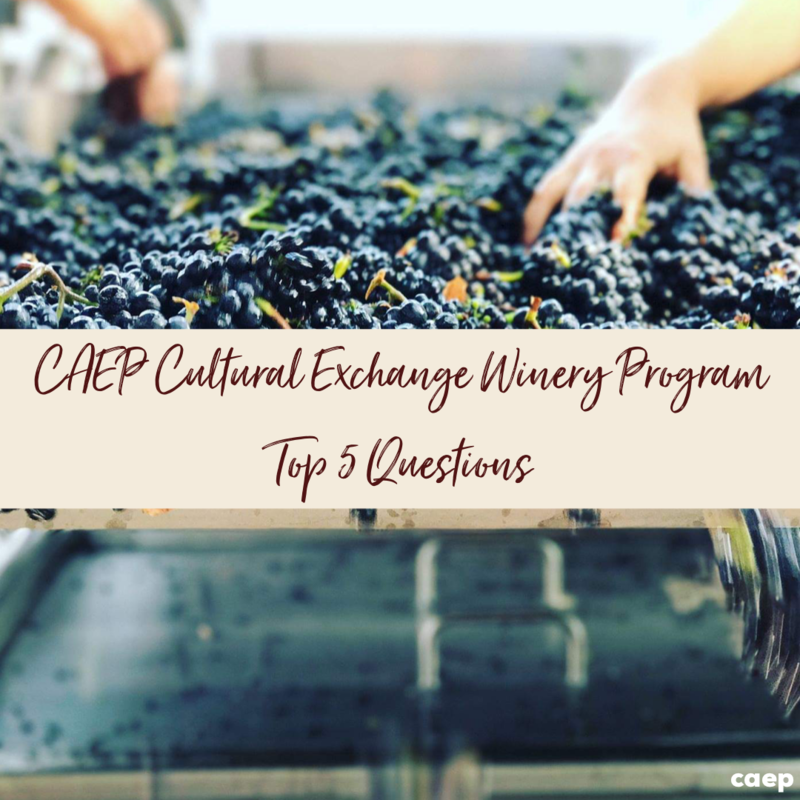 If you have any other questions regarding the cultural exchange trainee and intern program, CAEP or our enology program, please feel free to email social@caep.org!